The Boson Company hosted the first in a series of educational opportunities for Marshfield High School ACE Academy students on January 24th. Different construction topics will be covered that correspond to actual construction taking place at the school's new Athletic Facilities being constructed by Boson. 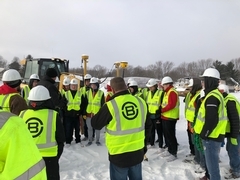 The first unit was to teach students how automation & technology is being used by Doine Excavating to perform the excavation and grading at the Baseball and Softball fields.Topics covered in the classroom and out on the site included: Auto Cad conversion to earthwork software; Site modeling; Earthwork estimating; Quality Control; Field GPS surveying & mapping; Field automated dozer control for line and grade, and site mapping. The Boson Company will be provide students with opportunities to perform actual work on the project as it progresses. The new Athletic Facilities at the High School are scheduled to be completed in late summer 2019 and work at the Middle School will begin immediately after.